Probably the greatest week ever invented, “Chocolate Week”. What better way to spend a week than indulging in great tasting chocolate? Well this week you can. At various places around the UK events will be taking place to celebrate Britain’s guiltiest pleasure. From chocolate tasting to cookery classes everyone can be a Charlie Bucket, to see where these events are taking place visit www.chocolateweek.co.uk. The highlight of the week is from the 13th-14th of October when Chocolate Unwrapped will be holding a chocolate event over two days, with the likes of chocolate sculptures, chocolate tasting, the best chocolatiers and leading chocolate companies from the UK it all takes place in this two day chocolate binge. You can get your tickets from www.chocolateunwrapped.co.uk. One of the leading companies at Chocolate Unwrapped is Fairtrade Chocolate giants, Divine Chocolate who again are a major sponsor in the nation’s favourite themed week. Divine are one of the leading fairtrade chocolate companies with the farmers owning 45% of the company. They have unmatched ethics and once you’ve tasted Divine’s mouth watering chocolate I can guarantee you’ll go back. There’s also a great new range of Divine Christmas chocolates available now. 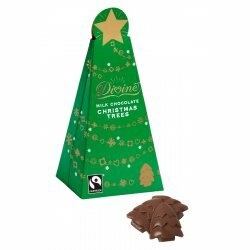 If you are unable to make it to one of the Chocolate Week events don’t worry, you can sample your own Divine Chocolate from www.ethicalsuperstore.com. Next story Buy A Tee, Get Socks Free! Previous story We Wood, Would You?